It’s hard to imagine these days, but there once was a time before escalators. The first escalator was patented in 1859 by Nathan Ames in Michigan. His design was called ‘revolving stairs’. However he never built his revolving stairs because he died in 1960. A few men tried after Ames: Jesse Reno designed the first working escalator over 30 years after Ames’ death. This escalator became a novelty ride at Coney Island. Around the same time a third man named George Wheeler was working on his own patent for an escalator until Charles Seeberger bought Wheeler’s patent in 1898 and teamed up with the Otis Elevator Company to design what we now know as an escalator. Seeberger and the Otis Elevator Company debuted their escalator at the Paris Fair in 1900. Once the Fair was over their escalator was installed in a Philadelphia department store and escalators slowly spread around the world. These days escalators are extremely commonplace. Someone who understands this more than most is Roger Haig: the National Support Manager for KONE. 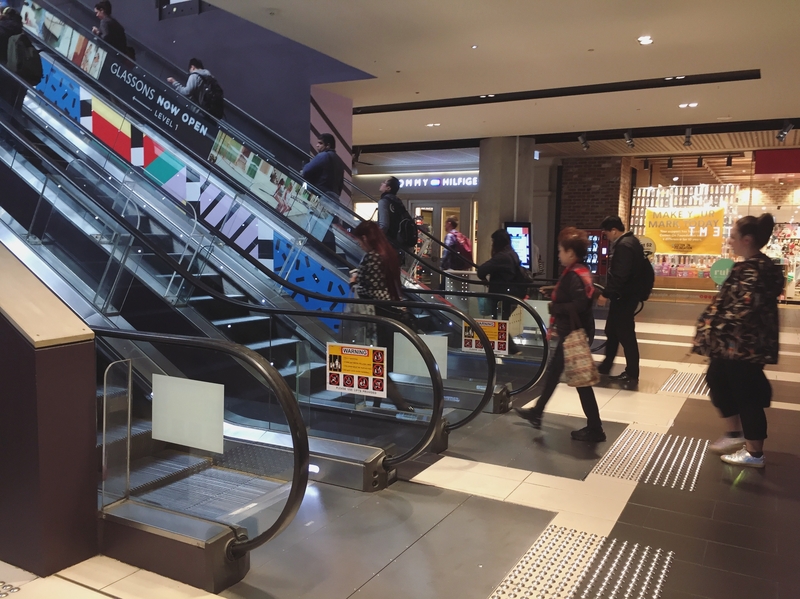 The impact escalators have had on the way public spaces are designed and accessed is enormous. Despite this, escalators are inherently a humble technology. They don’t call too much attention to themselves and they don’t ask much of their passengers. Find out where escalators came from and how they work in this episode of People Movers. Listen via Omny, iTunes or your podcast app of choice. Welcome to the first episode of People Movers: a podcast series about the impact of escalators on everyday life. I’m Lindsey Green and throughout this series I’m going to talk to you about escalators in a way you’ve hopefully never thought about them before. But why escalators? I have no affiliation with the escalator industry. I don’t work in manufacturing or servicing or design or even the selling of escalators. I come from a background in radio and I just so happen to really love escalators. To understand this series and how I got to this point let me take you back to where it all started. I started noticing really escalators a little over a year ago now. I got a new job which meant I was travelling to and from a particular train station in Melbourne a lot more often. I would be at the station twice a day, three times a week and always at peak hour. To get from the train to the street I had to take three escalators and I started noticing that one of the escalators was moving a lot faster than the other two. And not just a little bit, but a lot. Like a very noticeable amount. I figured it was because the fastest escalator was taking passengers from the train platform up to the ground level of the train station where there was a lot more room to move around. Whoever decided how fast the escalators go probably wanted to move people away from the train platform where more people would be coming in a few minutes later which would then increase the risk of someone falling onto the tracks. Who decides how fast they’ll go? Are they the same speed all day or is it only during peak hour that they’re faster? How fast can they actually go? Do escalators have speed limits? Who decides the speed limits? Does the incline of the escalator impact how fast it can go? And then my questions weren’t even about these escalators anymore. I started thinking about all sorts of things about their design and safety and construction and efficiency and how they work and where they came from and what happens when they die. To answer these questions I knew I had to knuckle down and do some research. To understand the history of escalators we need to go way back to the 1850’s when the first escalator was patented…patented…when the first was escalator was given a patent. In 1859 there was a man named Nathan Ames living in the state of Michigan in the United States. He patented what he called ‘Revolving Stairs’ and these stairs became known as the world’s first escalator. But Ames never actually got to build his Revolving Stairs because he died the year after gaining the patent in 1860. The first working escalator was patented over 30 years later by a second man named Jesse Reno. His escalator went onto become a novelty ride at Coney Island: the theme park in New York. Around the same time a third man named George Wheeler was working on his own patent for an escalator. Then a fourth man named Charles Seeberger bought Wheeler’s patent in 1898 and set to work with the Otis Elevator Company. Together, they designed what we now know as an escalator. And they debuted their escalator at the Paris Fair in 1900. To give you a sense of what technology was like back then, the previous Paris Fair in 1889 exhibited electricity and it was considered magic. Once the Fair was over the escalator was installed it in a department store in the United States. And the rest, as they say, is history. Okay so that’s where they came from – but how do they actually work? To answer this question I needed to bring in an expert. Lindsey: so your surname – is it pronounced Hay-g or how do I say that? My expert is Roger Haig the National Support Manager for KONE. Before we hear from him I just want to emphasise that Roger is one person working for one company. His views do not and should not be taken as a reflection of his employer or the industry he’s employed in. I called Roger from my home studio – also known as the inside of my wardrobe. L: So just to start off with. I was hoping that you could, Roger, give me a bit of background about what you do. So your role is National Support Manager. What does that mean? What do you do in that role? R: I’ve been with the lift industry since I left school. My first job was was with a company called EPL – Elevators Propriety Limited in Melbourne in the end of 1971. That was basically in the service centre there taking calls from people and sending mechanics out and various other bits and pieces. So I’ve been in the lift industry for some time. My role currently is to work with customers and guys in the front lines to support them in terms of traffic analysis, pricing, customer visits, product presentations, a bit of coaching and mentoring. So it’s a fairly broad based approach to support the guys in the front line with knowledge and experience. R: That’s okay that’s the way I explain it to myself because I’m not an engineer. An escalator is fundamentally a series of steps that are held together by a chain, so all of the steps are linked with a chain and there are rollers within that chain, and the chain is driven by a motor in the top station, in the top section of the escalator at the higher level. The steps are triangular in shape I guess if you look at the flat section then you’ll find the bottom of the step has another roller on it which sits on another track below the track that the chain is sitting on so that we make sure the step remains parallel to the ground so the person can stand on it and it travels in a horizontal format all the way to the top. And then you have a transition at the top and a transition at the bottom which is the curve between the incline and the flat section which has an additional set of tracks that allows the escalator step to flatten out and go under what we call the ‘comb plate’ which is a series of teeth that keep the indentations in the step clear. So it’s basically a chain that pulls some steps, the steps then go back down the incline on the underneath side hidden within the truss rotating around a series of gears in the top and the bottom. So it’s basically a continuous chain. L: Just going back to the point you made earlier about escalators being a relatively simple technology – how have you seen the industry change since you first joined? R: Escalators are – I should’ve said deceptively simple. There have been a lot of changes, a lot of fundamental changes, in the industry. Elevator and escalator technology is a technology that hasn’t changed all that much in 40 years if you think about it but there have been a lot of milestones that are to do with the way that the industry operates and also with technology. I think there’s a lot more competition now in the industry, there’s a lot more capacity of competitors within the industry to support each other’s equipment so it gives our customers a lot more opportunities to have competitive pricing in the marketplace. L: Yeah kind of on that point – is there a lot of competition or rivalry between different elevator and escalator companies? R: I guess there are 3-4 global players that are active in the Australian market. The level of competition between us I would have to say is fairly emotional at times. There’s a lot of push more market dominance between the players and a lot of aggressiveness in terms of market share and orders and increase in customer base. There is a very very high level of competition here and it’s something I’ve ever been able to understand although I do get very passionate about selling in the marketplace myself. L: I would imagine that at this point, you would probably be pretty passionate about it? Is that true or are they kind of just a job to you? R: No it’s not a job, you’re right it is a bit of a passion. It’s one of those industries I guess where it gets into your blood, it gets into your blood and from my point of view, personally, the most interesting part of my career is with the skill sets that I have I actively contribute to the development of people flow solutions for our customer’s buildings. We do peer review on traffic analysis, we assist building designers and developers with layouts of equipment and various other things so we actually, for me, the buzz I get is contributing to creating the environment that we live in and seeing the end result of that. There are buildings being modernised now that I sold in other parts in Australia and the world and to see the building skylines change and actually contributing to that in a way is my passion I would say. In the next episode I’ll be looking into the history of escalators in Australia. Chloe: They always find it quite interesting that that was the first escalator in Melbourne. They find it humorous that it was advertised as a magical stairway and that 60,000 people came in to ride it on the first day. I think that is always a little bit mind boggling. Finally I would like to acknowledge and pay respect to the traditional owners of the land on which I recorded and produced this episode of People Movers: the Wurundjeri People of the Kulin Nation. I would like to pay my respect to the Elders and Traditional Owners of the land that this podcast reaches. This land was never ceded and it always was, always will be, Aboriginal land.